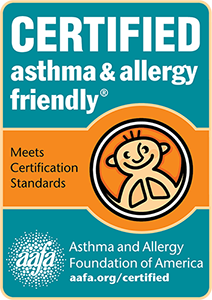 We are proud to announce our partnership with the asthma & allergy friendly® Certification Program. Our products have been identified as more suitable for people with asthma and allergies, a helpful designation for the more than 75 million people in the US dealing with asthma and allergen related issues. Wicked Sheets moisture-wicking bedding is awarded certification by the asthma & allergy friendly® Certification Program. This Kentucky based bedding company proves itself again with its dedication to innovation in comfort sleep products. Administered by the Asthma and Allergy Foundation of America (AAFA) in partnership with the international research organization Allergy Standards Limited (ASL), this independent program is the gold standard for identifying products that are suitable for people with asthma and allergies. “Before starting Wicked Sheets, I was a child psychologist. Seeing the impact asthma and allergies had on the children I worked with helped me to understand the need for products designed and guaranteed to give both children and their families the best rest possible,” says Alli Truttmann, CEO and Founder of Wicked Sheets. “We’re proud that our entire moisture-wicking line is now certified by AAFA, ensuring everyone, adults and children alike, who sleep on our bedding, knows our commitment to their rest. The asthma & allergy friendly® Certification Program is a unique, ground-breaking collaboration between the Asthma and Allergy Foundation of America (AAFA) and Allergy Standards Limited (ASL). The asthma & allergy friendly® Certification Program tests and certifies products that are scientifically proven to be more appropriate for customers concerned about allergies, asthma, and poor indoor air quality. The program works with retailers and manufacturers across product categories that are relevant to a ‘healthy home’ concept including textiles and apparel, air cleaners, dehumidifiers, paints, bedding, vacuum cleaners, washing machines, stuffed toys, cleaning services, and more. AAFA.org/Certified Wicked Sheets joins national companies 3M, Proctor & Gamble, Stanley Steamer, and more.